The 200 ruble note includes the iconic Crimea landmarks of the ancient Greek columns in Chersonesos Taurica, and the Monument to the Sunken Ships in Sevastopol, built in 1905. 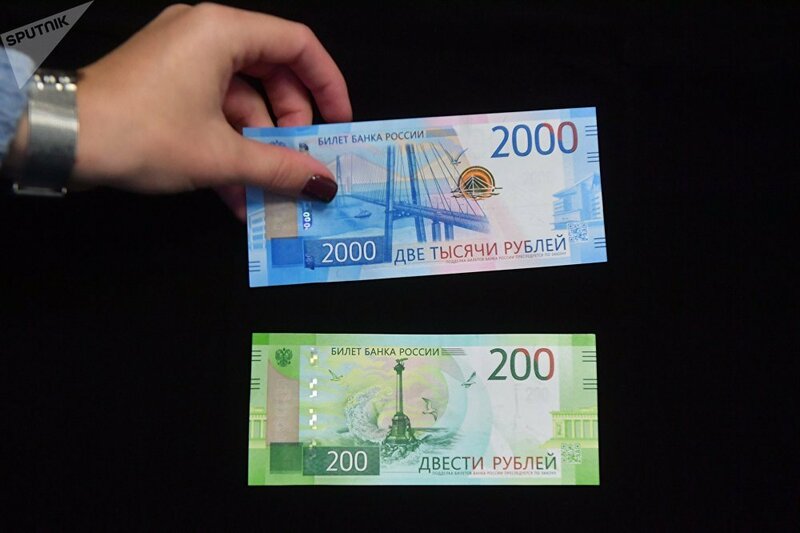 The 2,000 ruble bill features landmarks from Russia's more recent history, including the brand new Vostochny Cosmodrome spaceport and the Russky Bridge in Vladivostok. Moscow, Crimea and the Far East are the first regions where the bills are being introduced. Nabiullina expects the bills' circulation through the rest of the country to start by December as banks and enterprises receive training on their security features. The new banknotes are printed on a dense, durable paper, and include modern protection features against counterfeiting, elements to make them user-friendly for the blind, and a QR code which links to information about the banknote itself. The bills feature the National Emblem of Russia, rather than the emblem of the Bank of Russia that's found on other Russian bills. The symbol will be applied to all future designs and denominations. Currently, in addition to the 200 and 2,000 ruble bills, Russian paper money includes the 50, 100, 500, 1,000 and 5,000 ruble denominations, the designs of which were approved back in 1997. The new bills were selected following a multistage competition last year, in which Russians were invited to propose cities and symbols on a special website. Receiving about 5,000 entries, the Public Opinion Foundation then conducted polling to select the 10 most popular cities and territories and their 20 most recognized symbols. The final stage of the competition featured of an all-Russian sms vote, in which Crimea and the Far East and their landmarks were selected.